A 17-year-old runaway and her mother were face-to-face on national television, with talk show host Dr. Phil McGraw urging honest communication to heal their rift. He didn't offer a hug or shed a tear. Instead, he loudly lectured the distraught mom. "She's going to be gone or dead if you don't get real," McGraw said. "Do you want your baby out of the streets and into your life? Then quit preaching and talk to her!" Viewers are eating up the televised tough love. "Dr. Phil" has the best ratings of any new talk show since his mentor, Oprah Winfrey, debuted in 1986. It's a timely boost for the talk show format, which has been suffering the blahs. With Winfrey due to end her show in 2006, TV stations are wondering who will take her place at the top of the heap. In the season's first week, McGraw drew more viewers than four other new talk show hosts combined — Rob Nelson, James Van Praagh, Caroline Rhea and John Walsh. "Everyone knew it would be the highest rated of the new talk shows," said Marc Berman, an analyst for Media Week Online. "No one knew it would be this high." "Dr. Phil" started last month with every advantage. McGraw's once-a-week stint on Winfrey's show the past two years brought him a ready-made audience. That earned him desirable afternoon time slots in most cities, with one rule: that he couldn't be on at the same time as Winfrey. "He's not coming in as a rookie," said Roger King, whose company, King World Productions, distributes the syndicated show. Yet even McGraw's producers wondered how his methodical drawl would play every day. "I'm humbled by it," McGraw said of his early success. "And I don't say that trying to be, 'aw, shucks.' I have a lot of confidence in what we're doing." A trained psychologist, McGraw caught Winfrey's eye as a trial consultant during her legal fight with the Texas beef industry. He's already parlayed their connection into a small empire; even his 23-year-old son has written a self-help book. Dr. Phil treads the familiar talk show terrain of unruly children, bickering spouses and latest diseases. Instead of simply reporting, he advises people how to get out of tough spots, and his largely female audience nods through their tears. McGraw believes viewers find his unwillingness to pull punches refreshing. "He's the emotional compass that people need in their life everyday, and he provides the truth — two things that people need in their life on a daily basis," said Terry Wood, senior vice president of programming at Paramount TV, the show's producer. Further proof that Dr. Phil has arrived: He's being mocked regularly by David Letterman. Letterman serves up simplistic bromides to poke fun at McGraw, whose Web site offers "Dr. Phil's Ten Life Laws," including "you either get it, or you don't" and "you create your own experience." "I used to be living proof that anyone could get a TV show," Letterman said, "and now it's this guy." More seriously, a former Harvard Medical School psychiatry professor wrote a column in USA Today warning that people may substitute McGraw's advice for necessary medical treatment. 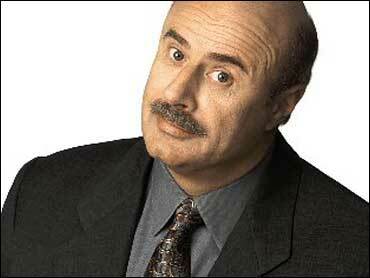 "Dr. Phil is as charismatic as can be but he cannot will a cure with one heartfelt admonition," wrote Steven Berglas. "Protracted follow-up after insight is the key to psychological change, and this is rarely the stuff of good TV or radio." McGraw said his show follows scrupulous standards by never inviting guests who are undergoing therapy without the permission of the therapist, and never featuring guests who have been suicidal or are taking psychotropic drugs. He believes viewers with problems will be more inclined to seek medical help after watching his show. Winfrey has been advising McGraw and his producers. Since her company, Harpo Productions, owns part of the show, she's sharing in his success. But is that success coming too fast? And could Winfrey, who's still comfortably ahead of "Dr. Phil" in the ratings, see her mentor becoming a threat? Interviewed on NBC before the Emmys last month, she seemed oddly taken aback by the enthusiastic reception McGraw received on the red carpet. "I think that the competitive juices are running with both of them," said King, whose company also distributes "The Oprah Winfrey Show." Should anyone anoint McGraw too quickly as her successor, King said he's talking with Winfrey about another TV project after "The Oprah Winfrey Show" ends. McGraw said he senses no competition between them. "She couldn't be more thrilled than a mom watching her kid in Little League," he said. "If I ever get to the point where I had as many viewers as Oprah, I think we'd both be moonwalking in the streets."